Chalet Village guests enjoy a common gathering place in the Clubhouse that features an arcade space, complete with pool, and other games for people of all ages. Wireless internet is available throughout Chalet Village. A land line telephone and a coin operated laundry area are also available in the Clubhouse. There is a paved and fenced basketball court with two hoops. A 24′ x 30′ in ground heated pool completes the offering. 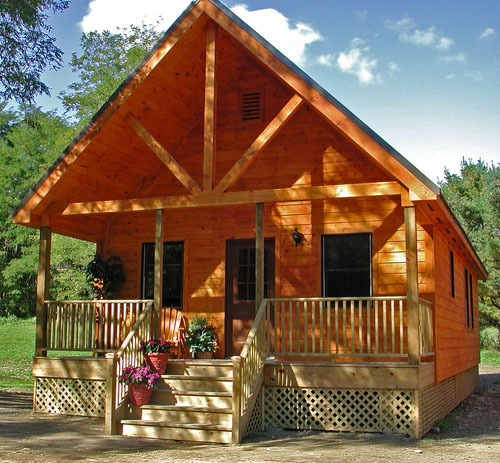 Each chalet has wooden siding, a covered porch with outdoor seating and a picnic table. Each one of these homes has its own parking area. All chalets have a living / dining area with a cathedral ceiling, and hardwood floors throughout. The kitchen area in each one has a two burner cook-top, a crock pot, microwave, toaster oven, coffee pot, sink and refrigerator as well as utensils for cooking and serving. The quality furnishings have been carefully chosen with your comfort in mind. This complex has mature trees which provide a natural shield from Route 28. To accommodate team parties, a facility with a full kitchen and seating for 60 people is provided.